Wednesdays to Sundays 12:00 to 5:00 pm. Closed Mondays and Tuesdays. New York: This exhibit ran at the Paley Center in New York: September 16 to October 8, 2017. Twenty-five years ago, the way we enjoyed cartoons changed forever when Cartoon Network launched as the very first twenty-four-hour network dedicated to animation. Join us at the Paley Center to celebrate twenty-five years of drawing on creativity! Visitors will experience the creative process from sketch to screen and beyond with an in-depth look at Steven Universe, enjoy special exhibits including stop-motion sets from Adventure Time, and have photo ops with sculptures from The Powerpuff Girls and Cartoon Network's newest hit OK K.O.! Let's Be Heroes! 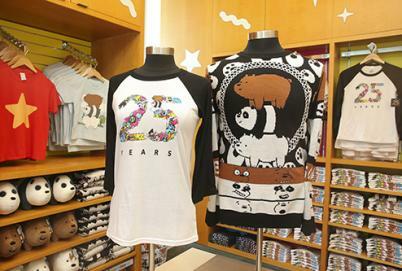 Browse the awesome selections of Cartoon Network shirts, plushes, socks, backpacks, and more! Join us in the theater to enjoy a taste of the Cartoon Network programming that is featured in the exhibit. Cartoon Network Sampler: One hour screening of episodes featured in our exhibit including Ben 10, Steven Universe, Adventure Time, OK K.O.! Let’s Be Heroes!, and The Powerpuff Girls. Steven Universe: One hour screening focusing on Steven Universe, including episodes, behind-the-scenes clips, music videos, other special Steven Universe content. An entire cable channel devoted to cartoons? 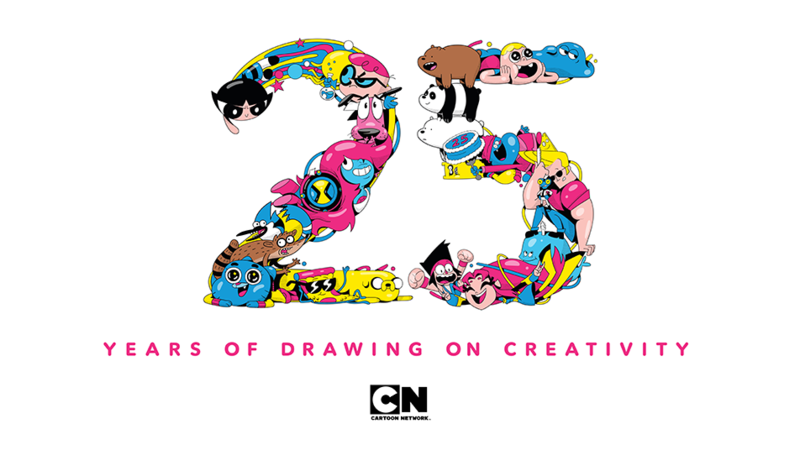 Twenty-five years ago, the concept was revolutionary, yet here we are celebrating the anniversary of the October 1, 1992, launch of Cartoon Network, an industry titan that has played a crucial role in redefining children’s television, entertaining and inspiring generations of youths and animators. Like Samurai Jack, Cartoon Network has traveled far and wide in twenty-five years, finding a magical place to fulfill its destiny. Initially, Cartoon Network provided its parent company, Turner Broadcasting, with a platform to leverage a formidable library of classic animation, including programming from Hanna-Barbera, MGM, UA, and Fleischer Studios—so, The Flintstones, The Jetsons, Scooby Doo Where Are You!, Tom and Jerry, Popeye, and numerous other iconic shows. But the following year CN began offering original programming—The Moxy Show was first, followed by Space Ghost Coast to Coast (combining old and new footage) and an incubator initiative, spearheaded by John Kricfalusi and Fred Seibert, that produced such shows as Dexter’s Laboratory, Johnny Bravo, and The Powerpuff Girls. In no time at all, Cartoon had demonstrated its commitment to experimentation and innovation, nurturing independent up-and-comers like Genndy Tartakovsky, Craig McCracken, and Van Partible. Turner’s 1996 merger with Time Warner opened new doors, resulting in the arrival of animated adaptations of such Warner properties as Justice League, Teen Titans, Acquaman, and the many permutations of Batman. In 1997 Cartoon launched Sean Atkins and Jason DeMarco’s Toonami, a programming block showcasing action anime. The list of successful CN shows over the last twenty-five years is way too long to present here, but just to whet your appetite: Adventure Time; Steven Universe; The Amazing World of Gumball; Ben 10; Ed, Edd, and Eddy; Samurai Jack; Grim & Evil; The Grim Adventures of Bill & Mandy; Foster’s Home for Imaginary Friends; Regular Show; and, from 2003–05, three seasons of Tartakovsky’s Star Wars: Clone Wars—perhaps you’ve heard of some of them? Our Cartoon Network 25th Anniversary Celebration continues with a special free panel event, The Creator’s Journey. Join creators Rebecca Sugar, Ian Jones-Quartey, and Julia Pott for a behind-the-scenes look at Cartoon Network’s hit series Steven Universe, OK K.O.! Let's Be Heroes, and the upcoming Summer Camp Island. Join creators and artists from Cartoon Network's most heroic shows to talk about how they have the most epic jobs on the planet! Learn how they got into animation, what advice they have for young artists, and maybe a few secrets about your favorite heroes. In person: Ian Jones-Quartey (Creator, OK K.O.! Let's Be Heroes!) and John Fang (Producer, Ben 10). FREE! You be the animator! Through arts and crafts projects from the Paley Education Department, children (ages 5-15) and families will have the opportunity to try out simple animation techniques and gain a better understanding of process behind some of their most beloved Cartoon Network programs. Using blank storyboard templates, children will be able to map out a scene of their own design. This activity will give children a chance to try their hand at drawing their favorite Cartoon Network characters and then using their creativity, imagination, and literacy skills to fill in the dialogue and action boxes for a complete scene. One of the best ways of understanding how animation comes to life is to do it yourself. Children will be given the opportunity to create their own simple animation toys like flip books, thaumatropes, and phenakistoscopes that show how small changes over multiple images make for exciting results!